It is Christmas Eve, so I’m not going to talk much about product, schedules or business plans. Every year, we debate whether or not we should extend the Christmas Surprise Package AFTER Christmas. And every year (so far), we extend it. Why? Because it’s the nice thing to do. We realize many of you are so full of the Christmas Spirit that you spend your money on gifts for your loved ones rather than yourself. This wonderful act of charity often leaves no money for you to buy a Palladium Surprise Package for yourself. We think that sacrifice is pretty awesome and what the holiday season is all about, so we extend the offer so that you selfless souls can pick up a Surprise Package after the holidays. We know this happens, because a lot people over the years have thanked us for the extension for this very reason. The response to my question last Weekly Update has convinced me to make a limited edition, 30th Anniversary Edition of the Heroes Unlimited RPG (originally released in June 1984). I plan to print 300-400 copies of a Thirtieth Anniversary “Hardcover Edition” of Heroes Unlimited RPG, 2nd Edition (i.e. the current rules) and offer it at the low, reasonable price of $40; signed and numbered by the Palladium staff. Available only from Palladium Books, while supplies last. It will become available in February 2014. Thank you for your input and comments that helped me to make that decision. Take a gander at some of these photographs. Orders for books and Christmas Surprise Packages have been pouring in and keeping us busy. On Monday, I posed as Spidey Santa in my new Spider-Man Hoodie (yes, I am that much of a comic book geek). It was fun and we posted it on our Facebook Page. We can get pretty silly at Palladium, sometimes. A good thing, I think. Oh, by the way, ALL the packages in that photo were shipped out on Monday. We also have a large, Halloween Rat wearing a Christmas hat to great people at the front door, provided they make it into our inner sanctum. The Surprise Packages are a lot of work, but we all enjoy spreading holiday cheer around the world — Palladium style. It brings us all great pleasure to make you smile when you open up those Grab Bags. Keep those imaginations burning bright. Thank you for helping to make 2013 an exciting and prosperous year. Thank you for being the greatest fans on the planet and for your support. Also, my sincere thanks to the friends and folks who sent me, or me and the Palladium crew, a gift or a card, as well as the kind words of appreciation via the many emails, Private Messages, and the comment section of the Surprise Packages. They are all appreciated. Reminder during this hectic time of holidays – make sure you take a moment to tell the ones you love, that you care. Give ‘em a call, send an e-mail, or an e-card, or a text message. And if you see them in person, give them a big hug or hearty handshake and let them know how much they mean to you. The Palladium family got a little smaller this year with the recent passing of Kay Kozora and Bill Bailey. Both were rather unexpected, so I am glad they knew how much they meant to me. With Christmas and New Year’s coming, make sure your loved ones know how special they are to you. Speaking of which, the Palladium Office Christmas Party was last Friday. It was a fun event with plenty of laughter and hugs, joy and gifts all around. Kathy Simmons made a feast for us and my dear friends, Thom, Ed, Paul, and Mark joined the fun with the Palladium crew. Lots of nerd-talk about science, history, sci-fi, fantasy, games, books, movies, TV shows, and comic books, but Kathy put up with all of us anyway. :) It was a good time, and the weather was outstanding, with the ice storm coming in the next evening. We escaped the storm’s wrath too, though some of the suburbs north of us were clobbered. I hope your Christmas is also filled with friends, joy and laughter. I’m going to leave the rest of this Christmas Update with a number of the many fan comments we get with the Christmas Surprise Package. 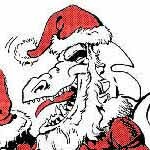 Warm tidings from all of us at Palladium Books to you and yours. G.G. in Lees Summit, Montana, writes (in part): I’ll say it again this year and for many years to come: Thank you. You guys have been wonderful and it’s fun to read the Weekly Updates. The books are wonderful, albeit, I wish they came out faster, but the quality has been wonderful ... better and better. L.C. in Belleville, Illinois, writes: Love the Surprise Packages. Have bought one every year for as long as I can remember. Thank you, Santa Kevin!!! B.T. in Buffalo, New York, writes: You guys made the game tht got me into gaming. Love it. Still have the collection of books my old GM gifted me before he passed away. He used to get this [Surprise Package] every year, and I want to get one to keep the tradition rolling. Happy holidays! A.L. in Hermon, Maine, writes: Hi, I’ve been waiting for this all year! Thank you for doing this! J.M. in Penngrove, California, writes (in part): Hey Guys and Gals of Palladium, I’d like to thank you for giving me YEARS of gaming without breaking my bank. This order is the first real ‘update’ to my collection in many years. Keep the awesomeness flowing, Merry Christmas and Happy New Year, everyone! K.M. in Garden City, Kansas, writes: Love the work you do. Palladium’s games were a huge part of my college life and I am hoping to bring it to a new group of friends. Thanks for all the hard work you all put in. I was proud to be a supporter for Northern Gun and it was awesome to see my name in the book [as a character]. I’ve been a supporter for years and I am looking forward to years more. I can’t wait to see what you do next. B.D.G. in Cathedral City, California, writes: The only game I haven’t tried and don’t own is RECON. I love your work and detail, keep up the good work. Happy holidays to the Palladium staff. J.L. in Pensacola, Florida, writes (in part): The Kickstarter campaign was brilliant and I hope you have more. J.C. in Niles, Michigan, writes: I love the Palladium gaming system and enjoy running games for my friends. This is my first Grab Bag, so I will be excited to see what comes in it. Thanks for giving us, your loyal fans, this kickass gift. F.P. in Altus, Oklahoma, writes: Loved the Christmas package you guys sent me, but I want more! J.G. in Midland, Texas, writes: I play all of Palladium’s games and collect everything, so thanks for all the wonderful games and stories. N.B. in Kenosho, Wisconsin, writes: Thank you all for providing me with such fun stories and adventures. I’m excited to share this world with our new group of adventurers! D.O.M. in Trinity, Florida writes: Palladium’s games, namely Rifts® and Palladium Fantasy®, kept me out of trouble in high school. Practically every weekend was a weekend long game for more than four years. Now, as a service member, I don’t get nearly that amount of time to play, but I still love to jot my ideas down for campaigns or even the odd idea for possible submission to The Rifter®. Who knows, right? I’d like to thank you for an awesome game system. It has been a huge part of my life. FREE Erick Wujcik Keepsake for Christmas Surprise Packages. A paperback novel or a magazine read and owned by Erick. This is a bonus item. Include it in your Wish List or in the Comments section by saying, “Please include an Erick Wujcik Keepsake,” and we’ll do so; while supplies last.